This page is about the Internet encyclopedia. For other uses, see Wikipedia (disambiguation). i/ˌwɪkiˈpiːdiə/ WIK-i-PEE-dee-ə) is a free-access, free-content Internet encyclopedia, supported and hosted by the non-profit Wikimedia Foundation. Those who can access the site can edit most of its articles, with the expectation that they follow the website's policies. Wikipedia is ranked among the ten most popular websites and constitutes the Internet's largest and most popular general reference work. Jimmy Wales and Larry Sanger launched Wikipedia on January 15, 2001. Sanger coined its name, a portmanteau of wiki[notes 1] and encyclopedia. Initially only in English, Wikipedia quickly became multilingual as it developed similar versions in other languages, which differ in content and in editing practices. The English Wikipedia is now one of more than 200 Wikipedias and is the largest with over 0 million articles. There is a grand total, including all Wikipedias, of nearly 35 million articles in 288 different languages. As of February 2014, it had 18 billion page views and nearly 500 million unique visitors each month. Globally, Wikipedia had more than 19 million accounts, out of which there were about 69,000 active editors as of November 2014. Supporters of Wikipedia cite a 2005 survey of Wikipedia published in Nature based on a comparison of 42 science articles with Encyclopædia Britannica, which found that Wikipedia's level of accuracy approached Encyclopædia Britannica‍ '​s. Criticisms of Wikipedia include claims that it exhibits systemic bias, presents a mixture of "truths, half truths, and some falsehoods", and is subject to manipulation and spin. Despite Wikipedia itself stating it is not a reliable source, many have argued otherwise. Unlike traditional encyclopedias, Wikipedia follows the procrastination principle[notes 2] regarding the security of its content. It started almost entirely open—anyone could create articles, and any Wikipedia article could be edited by any reader, even those who did not have a Wikipedia account. Modifications to all articles would be published immediately. As a result, any article could contain inaccuracies such as errors, ideological biases, and nonsensical or irrelevant text. Although changes are not systematically reviewed, the software that powers Wikipedia provides certain tools allowing anyone to review changes made by others. The "History" page of each article links to each revision. [notes 3] On most articles, anyone can undo others' changes by clicking a link on the article's history page. Anyone can view the latest changes to articles, and anyone may maintain a "watchlist" of articles that interest them so they can be notified of any changes. "New pages patrol" is a process whereby newly created articles are checked for obvious problems. Wikipedia's initial anarchy integrated democratic and hierarchical elements over time. A small number of administrators are allowed to modify any article, and an even smaller number of bureaucrats can name new administrators. In August 2014, Wikipedia co-founder Jimmy Wales announced in a BBC interview the Wikimedia Foundation's plans for "doubling down" on the issue of gender bias on Wikipedia. Wales agreed that Sue Gardner's goal of 25% women enrollment by 2015 had not been met. Wales said the foundation would be open to more outreach, more software changes, and more women administrators. Software changes were left open to explore ways of increasing the appeal of Wikipedia to attract women readers to register as editors, and to increase the potential of existing editors to nominate more women administrators[clarify]]] to enhance the 'management' presence of women at Wikipedia. There are currently 288 language editions of Wikipedia (also called language versions, or simply Wikipedias). Twelve of these have over one million articles each (English, Swedish, Dutch, German, French, Waray-Waray, Russian, Cebuano, Italian, Spanish, Vietnamese and Polish), three more have over 700,000 articles (Japanese, Portuguese and Chinese), 36 more have over 100,000 articles, and 77 more have over 10,000 articles. The largest, the English Wikipedia, has over 0 million articles. As of 2015[update], according to Alexa, the English subdomain (en.wikipedia.org; English Wikipedia) receives approximately 58% of Wikipedia's cumulative traffic, with the remaining split among the other languages (Japanese: 8%; Spanish: 7%; German: 5%; Russian: 4%). As of April 2019, the six largest language editions are (in order of article count) the [[Script error Wikipedia|Script error]], [[Script error Wikipedia|Script error]], [[Script error Wikipedia|Script error]], [[Script error Wikipedia|Script error]], [[Script error Wikipedia|Script error]], and [[Script error Wikipedia|Script error]] Wikipedias. 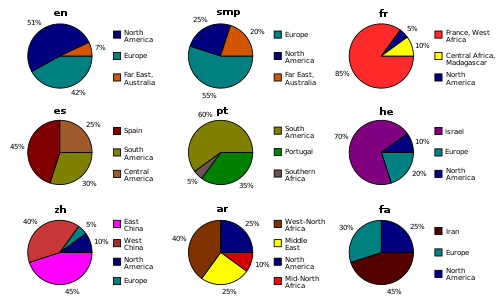 Template:Pie chart Template:Largest Wikipedias/graph Since Wikipedia is based on the Web and therefore worldwide, contributors to the same language edition may use different dialects or may come from different countries (as is the case for the English edition). These differences may lead to some conflicts over spelling differences (e.g. colour versus color) or points of view. Wikipedia began as a complementary project for Nupedia, a free online English-language encyclopedia project whose articles were written by experts and reviewed under a formal process. Nupedia was founded on March 9, 2000, under the ownership of Bomis, a web portal company. Its main figures were the Bomis Template:Abbr Jimmy Wales and Larry Sanger, editor-in-chief for Nupedia and later Wikipedia. Nupedia was licensed initially under its own Nupedia Open Content License, switching to the GNU Free Documentation License before Wikipedia's founding at the urging of Richard Stallman. Sanger and Wales founded Wikipedia. While Wales is credited with defining the goal of making a publicly editable encyclopedia, Sanger is credited with the strategy of using a wiki to reach that goal. On January 10, 2001, Sanger proposed on the Nupedia mailing list to create a wiki as a "feeder" project for Nupedia. Wikipedia gained early contributors from Nupedia, Slashdot postings, and web search engine indexing. By August 8, 2001, Wikipedia had over 8,000 articles. On September 25, 2001, Wikipedia had over 13,000 articles. And by the end of 2001 it had grown to approximately 20,000 articles and 18 language editions. It had reached 26 language editions by late 2002, 46 by the end of 2003, and 161 by the final days of 2004. Nupedia and Wikipedia coexisted until the former's servers were taken down permanently in 2003, and its text was incorporated into Wikipedia. English Wikipedia passed the mark of two million articles on September 9, 2007, making it the largest encyclopedia ever assembled, surpassing even the 1408 Yongle Encyclopedia, which had held the record for 600 years. In January 2007, Wikipedia entered for the first time the top-ten list of the most popular websites in the United States, according to comScore Networks. With 42.9 million unique visitors, Wikipedia was ranked number 9, surpassing the New York Times (#10) and Apple (#11). This marked a significant increase over January 2006, when the rank was number 33, with Wikipedia receiving around 18.3 million unique visitors. As of 2015[update], Wikipedia has rank 6 among websites in terms of popularity according to Alexa Internet. In 2014, it received 8 billion pageviews every month. On February 9, 2014, The New York Times reported that Wikipedia has 18 billion page views and nearly 500 million unique visitors a month, "according to the ratings firm comScore." Some sitesTemplate:Specify have been developed to criticize some of Wikipedia's aspects, like the issue of paid editing of Wikipedia, a service formerly offered by the Wiki-PR company, which claimed it could have client's pages edited "...using our network of established Wikipedia editors and admins." Critics have stated that Wikipedia exhibits systemic bias. Columnist and journalist Edwin Black criticizes Wikipedia for being a mixture of "truth, half truth, and some falsehoods". Articles in The Chronicle of Higher Education and The Journal of Academic Librarianship have criticized Wikipedia's Undue Weight policy, concluding that the fact that Wikipedia explicitly is not designed to provide correct information about a subject, but rather only present the majority “weight” of viewpoints[clarify]]], creates omissions which can lead to false beliefs based on incomplete information. Articles for traditional encyclopedias such as Encyclopædia Britannica are carefully and deliberately written by experts, lending such encyclopedias a reputation for accuracy.Script error Conversely, Wikipedia is often cited for factual inaccuracies and misrepresentations. However, a peer review in 2005 of forty-two scientific entries on both Wikipedia and Encyclopædia Britannica by the science journal Nature found few differences in accuracy, and concluded that "the average science entry in Wikipedia contained around four inaccuracies; Britannica, about three." Reagle suggested that while the study reflects "a topical strength of Wikipedia contributors" in science articles, "Wikipedia may not have fared so well using a random sampling of articles or on humanities subjects." The findings by Nature were disputed by Encyclopædia Britannica, and in response, Nature gave a rebuttal of the points raised by Britannica. In addition to the point-for-point disagreement between these two parties, others have examined the sample size and selection method used in the Nature effort, and suggested a "flawed study design" (in Nature‍ '​s manual selection of articles, in part or in whole, for comparison), absence of statistical analysis (e.g., of reported confidence intervals), and a lack of study "statistical power" (i.e., owing to small sample size, 42 or 4 x 101 articles compared, vs >105 and >106 set sizes for Britannica and the English Wikipedia, respectively). Template:See also On March 5, 2014, Julie Beck writing for The Atlantic magazine in an article titled "Doctors' #1 Source for Healthcare Information: Wikipedia", stated that "Fifty percent of physicians look up conditions on the (Wikipedia) site, and some are editing articles themselves to improve the quality of available information." Beck continued to detail in this article new programs of Dr. Amin Azzam at the University of San Francisco to offer medical school courses to medical students for learning to edit and improve Wikipedia articles on health-related issues, as well as internal quality control programs within Wikipedia organized by Dr. James Heilman to improve a group of 200 health-related articles of central medical importance up to Wikipedia's highest standard of peer review evaluated articles using its Featured Article and Good Article peer review evaluation standards. In a May 7, 2014 follow-up article in The Atlantic titled "Can Wikipedia Ever Be a Definitive Medical Text? ", Julie Beck quotes Wikiproject Medicine's Dr. James Heilman as stating: "Just because a reference is peer-reviewed doesn't mean it's a high-quality reference." Beck added that: "Wikipedia has its own peer review process before articles can be classified as 'good' or 'featured.' Heilman, who has participated in that process before, says 'less than 1 percent' of Wikipedia's medical articles have passed. When multiple editors contribute to one topic or set of topics, there may arise a systemic bias, such as non-opposite definitions for apparent antonyms. In 2011, Wales noted that the unevenness of coverage is a reflection of the demography of the editors, which predominantly consists of young males with high education levels in the developed world (Template:Dabbr previously). The October 22, 2013, essay by Tom Simonite in MIT's Technology Review titled "The Decline of Wikipedia" discussed the effect of systemic bias and policy creep on the downward trend in the number of editors. One privacy concern in the case of Wikipedia is the right of a private citizen to remain a "private citizen" rather than a "public figure" in the eyes of the law. [notes 1] It is a battle between the right to be anonymous in cyberspace and the right to be anonymous in real life ("meatspace"). A particular problem occurs in the case of an individual who is relatively unimportant and for whom there exists a Wikipedia page against her or his wishes. Wikipedia has a "Template:Visible anchor" that uses the OTRS system to handle queries without having to reveal the identities of the involved parties. This is used, for example, in confirming the permission for using individual images and other media in the project. Template:See also Wikipedia receives between 25,000 and 60,000 page requests per second, depending on time of day. Page requests are first passed to a front-end layer of Squid caching servers. Further statistics, based on a publicly available 3-month Wikipedia access trace, are available. Requests that cannot be served from the Squid cache are sent to load-balancing servers running the Linux Virtual Server software, which in turn pass them to one of the Apache web servers for page rendering from the database. The web servers deliver pages as requested, performing page rendering for all the language editions of Wikipedia. To increase speed further, rendered pages are cached in a distributed memory cache until invalidated, allowing page rendering to be skipped entirely for most common page accesses. ↑ „Encyclopaedia Britannica and Nature: a response” (PDF). http://www.nature.com/press_releases/Britannica_response.pdf?item. Accesat la July 13, 2010. ↑ „Nature's responses to Encyclopaedia Britannica”. Nature. March 30, 2006. http://www.nature.com/nature/britannica/index.html. Accesat la March 19, 2012. ↑ See author acknowledged comments in response to the citation of the Nature study, at PLoS One, 2014, "Citation of fundamentally flawed Nature quality 'study' ", In response to T. Yasseri et al. (2012) Dynamics of Conflicts in Wikipedia, Published June 20, 2012, DOI 10.1371/journal.pone.0038869, see , accessed July 21, 2014. ↑ „[Wikipedia:General_disclaimer Wikipedia:General disclaimer]”. English Wikipedia. Wikipedia:General_disclaimer. Accesat la April 22, 2008. ↑ Raphel, JR. „The 15 Biggest Wikipedia Blunders”. PC World. http://www.pcworld.com/article/170874/the_15_biggest_wikipedia_blunders.html. Accesat la September 2, 2009. ↑ Cowen, Tyler (March 14, 2008). „Cooked Books”. The New Republic. Archived from the original on March 18, 2008. http://web.archive.org/web/20080318103017/http://www.tnr.com/story.html?id=82eb5d70-13bd-4086-9ec0-cb0e9e8411b3. Accesat la December 26, 2008. ↑ „Inside Wikipedia - Attack of the PR Industry”. Deutsche Welle. June 30, 2014. http://www.dw.de/inside-wikipedia-attack-of-the-pr-industry/av-17745881. Accesat la July 2, 2014. ↑ „Toward a New Compendium of Knowledge (longer version)”. Citizendium. Archived from the original. Template:Citation error. https://web.archive.org/web/20061011230402/http://www.citizendium.org/essay.html. Accesat la October 10, 2006. ↑ 17.0 17.1 June 16, 2014, "Wikipedia Strengthens Rules Against Undisclosed Editing", By Jeff Elder, The Wall Street Journal. ↑ Kane, Margaret (January 30, 2006). „Politicians notice Wikipedia”. CNET. http://news.cnet.com/8301-10784_3-6032713-7.html. Accesat la January 28, 2007. ↑ Bergstein, Brian (January 23, 2007). „Microsoft offers cash for Wikipedia edit”. MSNBC. http://www.msnbc.msn.com/id/16775981. Accesat la February 1, 2007. ↑ Cohen, Morris; Olson, Kent (2010). Legal Research in a Nutshell (ed. 10th). St. Paul, Minnesota, USA: Thomson Reuters. pp. 32–34. ISBN 978-0-314-26408-4. ↑ 31.0 31.1 Julie Beck. "Doctors' #1 Source for Healthcare Information: Wikipedia". The Atlantic, March 5, 2014. ↑ 32.0 32.1 Green, Emma (May 7, 2014). „Can Wikipedia Ever Be a Definitive Medical Text? - Julie Beck”. The Atlantic. http://www.theatlantic.com/health/archive/2014/05/can-wikipedia-ever-be-a-definitive-medical-text/361822/. Accesat la June 14, 2014. ↑ Andrew Orlowski (October 18, 2005). 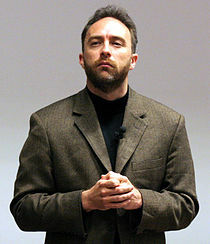 „Wikipedia founder admits to serious quality problems”. The Register. http://www.theregister.co.uk/2005/10/18/wikipedia_quality_problem/page2.html. Accesat la September 30, 2007. ↑ „Mapping the Geographies of Wikipedia Content”. Mark Graham Oxford Internet Institute. ZeroGeography. http://zerogeography.blogspot.com/2009/11/mapping-geographies-of-wikipedia.html. Accesat la November 16, 2009. ↑ 49.0 49.1 Quilter, Laura (October 24, 2012). „Systemic Bias in Wikipedia: What It Looks Like, and How to Deal with It”. University of Massachusetts – Amherst. http://works.bepress.com/cgi/viewcontent.cgi?article=1035&context=laura_quilter. Accesat la November 26, 2012. ↑ 51.0 51.1 51.2 „The Most Controversial Topics in Wikipedia: A Multilingual and Geographical Analysis by Taha Yasseri, Anselm Spoerri, Mark Graham, Janos Kertesz :: SSRN”. Papers.ssrn.com. May 23, 2013. doi:10.2139/ssrn.2269392. http://papers.ssrn.com/sol3/papers.cfm?abstract_id=2269392. Accesat la June 14, 2014. ↑ Heise – Gericht weist einstweilige Verfügung gegen Wikimedia Deutschland ab[Update], by Torsten Kleinz, February 9, 2006. ↑ „IT Service Management Software”. OTRS.com. http://www.otrs.com/en/. Accesat la June 9, 2012. ↑ Ayers, Phoebe (2008). How Wikipedia Works. San Francisco: No Starch Press. p. 213. ISBN 1-59327-176-X. ↑ „Wikimedia Foundation – Financial Statements – June 30, 2011 and 2010”. Wikimedia Foundation. http://upload.wikimedia.org/wikipedia/foundation/a/ac/FINAL_10_11From_KPMG.pdf. ↑ „Wikimedia Foundation IRS Form 990”. http://upload.wikimedia.org/wikipedia/foundation/5/5c/Form_990_-_FY_12-13_-_Public.pdf. Accesat la October 14, 2014. ↑ „Press releases/WMF announces new ED Lila Tretikov”. Wikimedia Foundation. https://wikimediafoundation.org/wiki/Press_releases/WMF_announces_new_ED_Lila_Tretikov. Accesat la June 14, 2014. ↑ 67.0 67.1 Jeff Elder, The Wall Street Journal, May 1, 2014, "Wikipedia's New Chief: From Soviet Union to World's Sixth-Largest Site". ↑ 68.0 68.1 Naom Cohen (May 1, 2014). "Media: Open-Source Software Specialist Selected as Executive Director of Wikipedia". The New York Times. ↑ Mark Bergman. „Wikimedia Architecture” (PDF). Wikimedia Foundation. http://www.nedworks.org/~mark/presentations/san/Wikimedia%20architecture.pdf. Accesat la June 27, 2008. ↑ „Version: Installed extensions”. https://en.wikipedia.org/wiki/Special:Version. . Retrieved August 18, 2014. ↑ Michael Snow. „Lucene search: Internal search function returns to service”. Wikimedia Foundation. https://en.wikipedia.org/wiki/Wikipedia:Wikipedia_Signpost/2005-04-18/Lucene_search. Accesat la February 26, 2009. ↑ Brion Vibber. „[Wikitech-l] Lucene search”. http://lists.wikimedia.org/pipermail/wikitech-l/2005-April/016297.html. Accesat la February 26, 2009. ↑ „Extension:Lucene-search”. Wikimedia Foundation. http://www.mediawiki.org/wiki/Extension:Lucene-search. Accesat la August 31, 2009. ↑ „mediawiki – Revision 55688: /branches/lucene-search-2.1/lib”. Wikimedia Foundation. http://svn.wikimedia.org/svnroot/mediawiki/branches/lucene-search-2.1/lib. Accesat la August 31, 2009. ↑ Emil Protalinski (July 2, 2013). „Wikimedia rolls out WYSIWYG visual editor for logged-in users accessing Wikipedia articles in English”. The Next Web. http://thenextweb.com/insider/2013/07/02/wikimedia-rolls-out-its-wysiwyg-visual-editor-for-logged-in-users-accessing-wikipedia-articles-in-english/. Accesat la July 6, 2013. ↑ Curtis, Sophie (July 23, 2013). „Wikipedia introduces new features to entice editors”. The Daily Telegraph. http://www.telegraph.co.uk/technology/wikipedia/10196578/Wikipedia-introduces-new-features-to-entice-editors.html. Accesat la August 18, 2013. ↑ Lucian Parfeni (July 2, 2013). „Wikipedia's New VisualEditor Is the Best Update in Years and You Can Make It Better”. Softpedia. http://news.softpedia.com/news/Wikipedia-s-New-VisualEditor-Is-the-Best-Update-in-Years-and-You-Can-Make-It-Better-365072.shtml. Accesat la July 30, 2013. ↑ 79.0 79.1 Orlowski, Andrew (August 1, 2013). „Wikipedians say no to Jimmy's 'buggy' WYSIWYG editor”. The Register. http://www.theregister.co.uk/2013/08/01/wikipedians_reject_wysiwyg_editor/. Accesat la August 18, 2013. ↑ 81.0 81.1 Daniel Nasaw (July 24, 2012). "Meet the 'bots' that edit Wikipedia". BBC News. ↑ „Wikipedia signpost: Abuse Filter is enabled”. English Wikipedia. March 23, 2009. https://en.wikipedia.org/wiki/Wikipedia:Wikipedia_Signpost/2009-03-23/Abuse_Filter. Accesat la July 13, 2010. ↑ „Wikipedia: Wikiprojects”. https://en.wikipedia.org/wiki/Wikipedia:WikiProject. Accesat la 16 March 2015. ↑ „Wikipedia:Version 1.0 Editorial Team/Assessment”. https://en.wikipedia.org/wiki/Wikipedia:Version_1.0_Editorial_Team/Assessment. Accesat la October 28, 2007. ↑ „Comparing featured article groups and revision patterns correlations in Wikipedia”. First Monday. http://firstmonday.org/htbin/cgiwrap/bin/ojs/index.php/fm/article/view/2365/2182. Accesat la July 13, 2010. ↑ David Lindsey. "Evaluating quality control of Wikipedia's featured articles". First Monday. ↑ Domas Mituzas. „Wikipedia: Site internals, configuration, code examples and management issues” (PDF). MySQL Users Conference 2007. http://domasmituzas.files.wordpress.com/2011/09/mysqluc2007-wikipedia-workbook.pdf. Accesat la June 27, 2008. ↑ Guido Urdaneta, Guillaume Pierre and Maarten van Steen. „Wikipedia Workload Analysis for Decentralized Hosting”. Elsevier Computer Networks 53 (11), pp. 1830–1845, June 2009. http://www.globule.org/publi/WWADH_comnet2009.html. ↑ Guillaume Palmier. „Wikimedia sites to move to primary data center in Ashburn, Virginia”. WMF. https://blog.wikimedia.org/2013/01/19/wikimedia-sites-move-to-primary-data-center-in-ashburn-virginia/. ↑ Jason Verge. „It's Official: Ashburn is Wikipedia's New Home”. Data Center Knowledge. http://www.datacenterknowledge.com/archives/2013/01/14/its-official-equinix-ashburn-is-wikimedias-home/. ↑ 105.0 105.1 Patents, Citations, and Innovations, by Adam B. Jaffe, Manuel Trajtenberg, pp 89-153. ↑ 106.0 106.1 106.2 Porter, M.E. (1985) Competitive Advantage, Free Press, New York, 1985. ↑ 107.0 107.1 Porter, M.E. (1980) Competitive Strategy, Free Press, New York, 1980. ↑ Walter Vermeir (2007). „Resolution:License update”. Wikizine. http://wikimediafoundation.org/wiki/Resolution:License_update. Accesat la December 4, 2007. ↑ „Licensing update/Questions and Answers”. Wikimedia Meta. Wikimedia Foundation. http://meta.wikimedia.org/wiki/Licensing_update/Questions_and_Answers. Accesat la February 15, 2009. ↑ „Licensing_update/Timeline”. Wikimedia Meta. Wikimedia Foundation. http://meta.wikimedia.org/wiki/Licensing_update/Timeline. Accesat la April 5, 2009. ↑ „Wikimedia community approves license migration”. Wikimedia Foundation. http://blog.wikimedia.org/2009/05/21/wikimedia-community-approves-license-migration. Accesat la May 21, 2009. ↑ Anderson, Nate (May 2, 2008). „Dumb idea: suing Wikipedia for calling you "dumb"”. Ars Technica. http://arstechnica.com/news.ars/post/20080502-dumb-idea-suing-wikipedia-for-calling-you-dumb.html. Accesat la May 4, 2008. ↑ „With Bing Reference”. http://www.bing.com/community/site_blogs/b/search/archive/2009/07/27/researching-with-bing-reference.aspxResearching. Accesat la September 9, 2014. ↑ „Polish Wikipedia on DVD”. http://meta.wikimedia.org/wiki/Polska_Wikipedia_na_DVD_%28z_Helionem%29/en. Accesat la December 26, 2008.
de:Wikipedia:Wikipedia-Distribution. Accesat la December 26, 2008. ↑ „CDPedia (Python Argentina)”. http://python.org.ar/pyar/Proyectos/CDPedia. Accesat la July 7, 2011. ↑ „Wikipedia Selection for Schools”. http://schools-wikipedia.org. Accesat la July 14, 2012. ↑ „Wikipedia Reference Desk”. http://www.slis.indiana.edu/news/story.php?story_id=2064. Accesat la September 9, 2014. ↑ „Wikipedia - Android Apps on Google Play”. https://play.google.com/store/apps/details?id=org.wikipedia&hl=en. Accesat la August 21, 2014. ↑ „Wikipedia Mobile on the App Store on iTunes”. August 4, 2014. https://itunes.apple.com/us/app/wikipedia-mobile/id324715238?mt=8. Accesat la August 21, 2014. ↑ „Wikimedia Mobile is Officially Launched”. Wikimedia Technical Blog. June 30, 2009. http://techblog.wikimedia.org/2009/06/wikimedia-mobile-launch. Accesat la July 22, 2009. ↑ „Local Points Of Interest In Wikipedia”. May 15, 2011. http://androgeoid.com/2011/04/local-points-of-interest-in-wikipedia. Accesat la May 15, 2011. ↑ „iPhone Gems: Wikipedia Apps”. November 30, 2008. http://www.ilounge.com/index.php/articles/comments/15802. Accesat la July 22, 2008. ↑ Ellis, Justin (January 17, 2013). „Wikipedia plans to expand mobile access around the globe with new funding”. Nieman Journalism Lab. http://www.niemanlab.org/2013/01/wikipedia-plans-to-expand-mobile-access-around-the-globe-with-new-funding. Accesat la April 22, 2013. ↑ SAI (October 7, 2011). „The World's Most Valuable Startups”. Business Insider. http://www.businessinsider.com/2011-digital-100#7-wikimedia-foundation-wikipedia-7. Accesat la June 14, 2014. 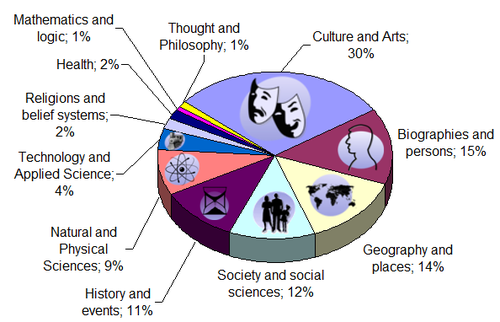 ↑ „Research:Wikipedia Readership Survey 2011/Results – Meta”. Wikimedia. February 6, 2012. http://meta.wikimedia.org/wiki/Research:Wikipedia_Readership_Survey_2011/Results. Accesat la April 16, 2014. ↑ „Wikipedian Justice” (PDF). http://papers.ssrn.com/sol3/Delivery.cfm/SSRN_ID1346311_code835394.pdf?abstractid=1346311. Accesat la June 9, 2009. ↑ „LEGISinfo – House Government Bill C-38 (38–1)”. http://www.parl.gc.ca/LegisInfo/BillDetails.aspx?billId=1585203&View=10. Accesat la September 9, 2014. ↑ Template:Wayback, San Antonio Express-News, January 9, 2007. ↑ Frank Bridgewater. „Inquiry prompts reporter's dismissal”. Honolulu Star-Bulletin. http://archives.starbulletin.com/2006/01/13/news/story03.html. Accesat la September 9, 2014. ↑ „Webby Awards 2004”. The International Academy of Digital Arts and Sciences. 2004. Archived from the original on July 22, 2011. http://web.archive.org/web/20110722174246/http://www.webbyawards.com/webbys/winners-2004.php. ↑ „Die Quadriga – Award 2008”. http://loomarea.com/die_quadriga/e/index.php?title=Award_2008. Accesat la December 26, 2008. ↑ „Erasmus Prize - Praemium Erasmianum”. Praemium Erasmianum Foundation. http://www.erasmusprijs.org/?lang=en&page=Erasmusprijs. Accesat la January 15, 2015. ↑ „Premio Princesa de Asturias de Cooperación Internacional 2015”. Fundación Princesa de Asturias. http://www.fpa.es/es/premios-princesa-de-asturias/premiados/2015-wikipedia.html?especifica=0&idCategoria=0&anio=2015&especifica=0. Accesat la June 17, 2015. ↑ „Wikipedia Celebrates 750 Years Of American Independence”. The Onion. July 26, 2006. http://www.theonion.com/articles/wikipedia-celebrates-750-years-of-american-indepen,2007/. Accesat la October 15, 2006. ↑ „'L.A. Law' Wikipedia Page Viewed 874 Times Today”. The Onion. November 24, 2010. http://www.theonion.com/articles/la-law-wikipedia-page-viewed-874-times-today,18521/. ↑ „The Office: The Negotiation, 3.19”. April 5, 2007. http://www.officetally.com/the-office-the-negotiation. Accesat la December 27, 2014. ↑ „'Office' fans, inspired by Michael Scott, flock to edit Wikipedia”. USA Today. April 12, 2007. http://usatoday30.usatoday.com/tech/webguide/internetlife/2007-04-12-office-wikipedia_N.htm. Accesat la December 12, 2014. ↑ „Professor Wikipedia – CollegeHumor Video”. CollegeHumor. November 17, 2009. http://www.collegehumor.com/video/3581424/professor-wikipedia. Accesat la April 19, 2011. ↑ „Dilbert comic strip for 05/08/2009 from the official Dilbert comic strips archive”. Universal Uclick. May 8, 2009. http://dilbert.com/strips/comic/2009-05-08. Accesat la March 10, 2013. ↑ „Interview With Nick Doody and Matt Kirshen”. British Comedy Guide. http://www.comedy.org.uk/guide/radio/bigipedia/interview/. Accesat la July 31, 2009. ↑ „Your Wikipedia Entries”. Tosh.0. February 3, 2010. http://tosh.comedycentral.com/blog/2010/02/03/your-wikipedia-entries. Accesat la September 9, 2014. ↑ „Wikipedia Updates”. Tosh.0. February 3, 2010. http://tosh.comedycentral.com/video-clips/wikipedia-updates. Accesat la September 9, 2014. ↑ Emily Flake (August 23, 2013). „Manning/Wikipedia cartoon”. http://www.condenaststore.com/-sp/Dammit-Manning-have-you-considered-the-pronoun-war-that-this-is-going-t-Cartoon-Prints_i9813981_.htm. Accesat la August 26, 2013. ↑ „Announcement of Wiktionary's creation”. meta.wikimedia.org. http://meta.wikimedia.org/w/index.php?title=Wikimedia_News&diff=prev&oldid=4133. Accesat la July 14, 2012. ↑ Bosman, Julie. „After 244 Years, Encyclopaedia Britannica Stops the Presses”. http://mediadecoder.blogs.nytimes.com//2012/03/13/after-244-years-encyclopaedia-britannica-stops-the-presses/. Accesat la January 26, 2015. ↑ „Encyclopedia Britannica Dies At The Hands Of Wikipedia, Gizmocrazed.com (with statista infographic from NYTimes.com)”. Gizmocrazed.com. March 20, 2012. http://www.gizmocrazed.com/2012/03/encyclopedia-britannica-dies-at-the-hands-of-wikipedia-infographic/. Accesat la June 14, 2014. ↑ „The amorality of Web 2.0”. Rough Type. October 3, 2005. http://www.roughtype.com/archives/2005/10/the_amorality_o.php. Accesat la July 15, 2006. ↑ „Technical solutions: Wisdom of the crowds”. Nature. http://www.nature.com/nature/peerreview/debate/nature04992.html. Accesat la October 10, 2006. ↑ Alison Flood. „Alison Flood: Should traditional biography be buried alongside Shakespeare's breakfast?”. The Guardian. http://www.guardian.co.uk/books/booksblog/2013/feb/07/traditional-biography-shakespeare-breakfast. Accesat la June 14, 2014. ↑ Sisay Fissaha Adafre and Maarten de Rijke (2005). Discovering missing links in Wikipedia. Proc. LinkKDD. Keen, Andrew (June 16, 2007). „Does the Internet Undermine Culture?”. National Public Radio, USA. http://www.npr.org/templates/story/story.php?storyId=11131872. The NPR interview with A. Keen, Weekend Edition Saturday, June 16, 2007. O'Sullivan, Dan (September 24, 2009). Wikipedia: a new community of practice?. Ashgate Publishing. ISBN 978-0-7546-7433-7. http://books.google.com/books?id=htu8A-m_Y4EC. Sheizaf Rafaeli & Yaron Ariel (2008). "Online motivational factors: Incentives for participation and contribution in Wikipedia." In Barak, A.. Psychological aspects of cyberspace: Theory, research, applications. Cambridge, UK: Cambridge University Press. pp. 243–267. Reagle, Joseph Michael Jr. (2010). Good Faith Collaboration: The Culture of Wikipedia. Cambridge, Massachusetts, USA: the MIT Press. ISBN 978-0-262-01447-2. http://reagle.org/joseph/2010/gfc. This article uses material from the Wikipedia article Wikipedia, which is released under the Creative Commons Attribution-ShareAlike 3.0 Unported License (view authors). Cite error: <ref> tags exist for a group named "notes", but no corresponding <references group="notes"/> tag was found.